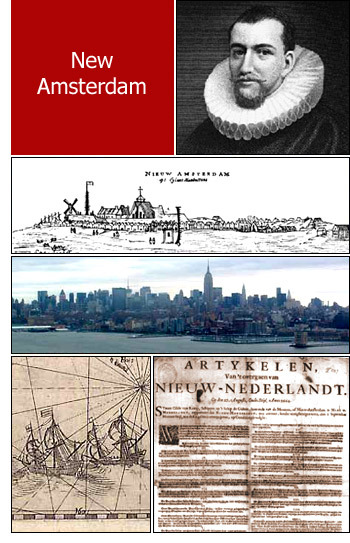 The long and narrow Island of Manhattan was a wild and beautiful spot in the year 1609. In this year a little ship sailed up the bay below the island, took the river to the west, and went on. In these days there were no sky scrapeers towering in the sky, no noisy hum of running traffic. None of these things. But in their place were beautiful trees with spreading branches, stretches of sand−hills, and green patches of grass. In the branches of the trees there were birds of varied colors, and wandering through the tangled undergrowth were many wild animals. The people of the island were men and women whose skins were quite red; strong and healthy people who clothed themselves in the furs of animals and made their houses of the trees and vines. In this year of 1609, these people gathered on the shore of their island and looked with wonder at the boat, so different from any they had ever seen, as it was swept before the wind up the river. The ship was called "De Halve Maen" (the Half Moon), and it had come from Amsterdam, Holland, the Netherlands. The Netherlands was quite a small country in the northern part of Europe, not nearly as large as the State of New York, and was usually called Holland, as Holland was the most important of its several states. The Dutch owned other lands than these. They had islands in the Indian Ocean that were rich in spices of every sort, and the other European countries needed these spices. These islands, being quite close to India, were called the East Indies, and the company of Dutch merchants who did most of the business with them was called the East India Company. They had many ships, and the "Halve Maen" (Half Moon) was one of them. It was a long way to the East India Islands from Holland, the ships had to go around Africa by way of the Cape of Good Hope. Besides being a long distance, it was a dangerous passage; for although from its name one might take the Cape of Good Hope to be a very pleasant place, the winds blew there with great force, and the waves rolled so high that they often dashed the fragile ships to pieces. So the merchants of Holland, and of other countries for that matter, were always thinking of a shorter course to the East Indies. They knew very little of North or South America, and believed that these countries were simply islands and that it was quite possible that a passage lay through them which would make a much nearer and a much safer way to the East Indies than around the dread Cape of Good Hope. So the "Oost Indische Compagnie" (Dutch East India Company) built the ship "Halve Maen" and got Henry Hudson from England to take charge of it, and started him off to find the short way. Hudson was chosen because he had already made two voyages for an English company, trying to find that same short passage, and was supposed to know ever so much more about it than anyone else. When the "Halve Maen" sailed up the river, Hudson was sure that he had found the passage to the Indies, and he paid very little attention to the red−skinned Indians on the island shore. But when the ship got as far as where Albany is now, the water had become shallow, and the river−banks were so near together that Hudson gave up in despair, and said that, after all, he had not found the eagerly sought−for passage to India, but only a river! Then he turned the ship, sailed back past the island, and returned to Holland to tell of his discovery. He told of the fur−bearing animals, and of what a vast fortune could be made if their skins could only be got to Holland, where furs were needed. He told of the Indians; and the river which flowed past the island he spoke of as "The River of the Mountains." The directors of the "Oost Indische Compagnie" (Dutch East India Company) were not particularly pleased with Hudson's report. They were angry because the short cut to India had not been found, and they thought very little of the vast storehouse of furs which he had discovered. Neither did the Company care a great deal about Hudson, for they soon fell out with him, and he went back to the English company and made another voyage for them, still in search of the short passage to India. But in this last voyage, he only succeeded in finding a great stretch of water far to the north, that can be seen on any map as Hudson's Bay. His crew after a time grew angry when he wanted to continue his search. There was a mutiny on the ship, and Hudson and his son and seven of the sailors who were his friends were put into a small boat, set adrift in the bay to which he had given his name, and no trace of them was ever seen again. Long, long years after that time, another explorer found the passage that Hudson had lost his life searching for. It is The Northwest Passage, far up toward the North Pole, in the region of perpetual cold and night. So Hudson never knew that the passage he had looked for was of no value, and we may be sure he had never imagined that there would ever be a great city on the island he had discovered. The Dutch came to think a great deal of Hudson after he was dead. The stream which he had called "The River of the Mountains" they named Hudson's River. They even made believe that Hudson was a Dutchman − although most people will remember he was an Englishman − and were in the habit of speaking of him as "Hendrick" Hudson. The Indians were scattered over America in great numbers. The tribe on the island were called Manhattans, and from that tribe came the name of the Island of Manhattan. All the Indians, no matter which tribe they belonged to, looked very much alike and acted very much the same. Their eyes were dark, and their hair long, straight, and black. When they were fighting, they daubed their skins with colored muds − war paint the white men called it − and started out on the "war−path". They loved to hunt and fish, as well as to fight, and they fought and murdered as cruelly and with as little thought as they hunted the wild animals or hooked the fish. They held talks which were called "councils," and one Indian would speak for hours, while the others listened in silence. And when they determined upon any action, they carried it out, without a thought of how many people were to be killed, or whether they were to be killed themselves.